So, is Greenland a government-owned entity? And what about those Chinese condo investors? This is the second of a few articles based on the 1/24/17 Atlantic Yards/Pacific Park meeting. Yesterday I wrote about the unclear timing of the project buildout. A bit of tension emerged at the meeting over the role of Chinese investors and also the Shanghai-based Greenland Group, whose Greenland USA subsidiary owns 70% of the Atlantic Yards/Pacific Park project going forward (with the exception of the B2 tower, aka 461 Dean, and the Barclays Center operating company). In the joint venture Greenland Forest City Partners, Forest City Ratner has 30%. After Forest City Ratner's Ashley Cotton described Greenland as "a committed partner, they have financial wherewithal," Jimmy Greenfield, a Dean Street property owner, responded, "Greenland is a Chinese government-run corporation, so you don't meet the same--." "We're publicly traded company," countered Scott Solish, Greenland USA's Project Manager, adding that they were excited about opening the new buildings. That said, as I wrote, Greenland’s commitment may have diminished somewhat, since it and Forest City are marketing stakes in three towers (B12, B13, B4). A government-owned entity? Yes. Even if not formally controlled by Shanghai. calls Greenland "a local state-owned enterprise"
Later in the meeting, resident Steve Ettlinger told Solish he was curious about the proper description of Greenland. "Everybody... identifies Greenland as a Chinese government-, Shanghai government-owned entity, and you said it's publicly traded company. Can you inform us a little bit about the ownership?" "Me personally, I can’t," Solish responded. "You work for them, you must know something," Ettlinger responded. "You said it was publicly traded." "I don’t have the exact information," Solish said. "I have enough to do in my day-to-day job." Ettlinger asked to follow up by email. It's fair to call it a publicly-traded, state-owned (or government-owned) enterprise, even if that state ownership is no longer a majority. However, even if Greenland may no longer be fully state-controlled, the current ownership structure seems to favor state control. 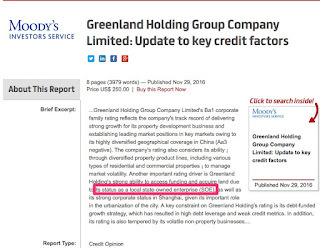 As I wrote last February, it's a bit murky: Greenland was long called a "state-controlled enterprise group," as noted by this 12/9/15 note from ratings agency Moody's, with the Shanghai State-Owned Assets Supervision and Administration Commission (SASAC) "effectively the largest shareholder." 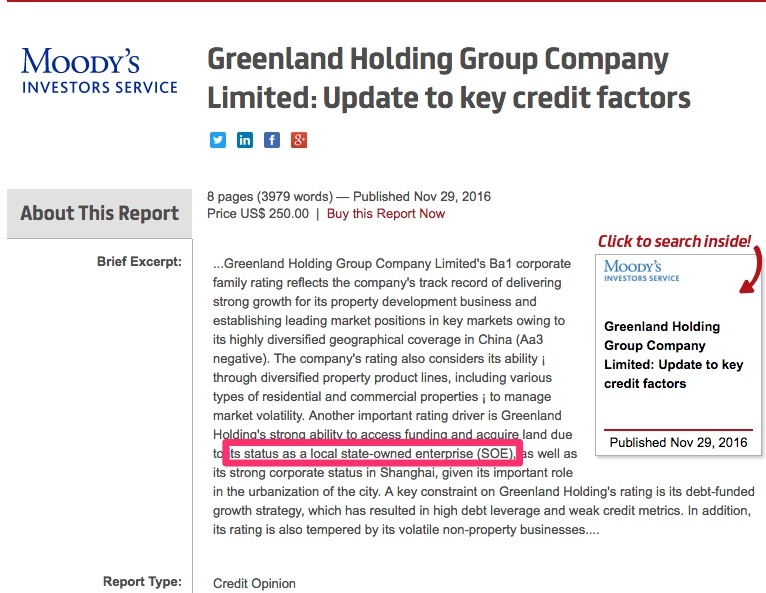 In November 2016, as shown in the screenshot above, Moody's called it a "local state-owned enterprise." But state ownership is not incompatible with being publicly traded, and if the state ownership is now below 50%, that does not necessarily remove state control. After all, Wikipedia describes (without a footnote) the SASAC share as today over 46%, with nearly 29% more owned by managers and employees of Greenland Holdings. That seems to favor control, even if it doesn't assure it. In 2015, Greenland was listed on the Shanghai Stock Exchange. As the Hong Kong-based South China Morning Post reported 4/24/15, that was achieved via an asset swap with another company, Jinfeng, in a move the newspaper (and a Greenland press release) described as a "back-door listing." "The asset swap deal is part of Shanghai’s increasing efforts to make its state-owned enterprises more profitable, efficient and market-based, in keeping with China’s reform agenda," Greenland Australia said in a press release. In other words, Greenland was not about to be a non-state-owned enterprise. According to Greenland's Semi-Annual Report for the period ended 6/30/15, filed with the China Securities Regulatory Commission on 8/25/15, state entities held 44.72% of the shares, a Greenland spokeswoman told me last year. At the very least, the company remains significantly state-owned. 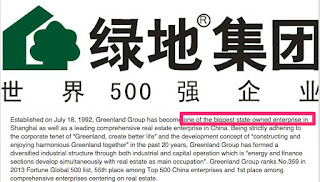 Greenland's own LinkedIn page (above) may not have been recently updated (or copy-edited), but it states that it "has become one of the biggest state-owned enterprise in Shanghai." Greenland USA was established in 2013 as a subsidiary of Greenland Holding Group, which is publicly traded on the Shanghai Stock Exchange (SSE) and ranked 311th on the Fortune Global 500. Greenland Group has developed properties in 26 provinces in China as well as in nine countries on four continents, including the US, Australia, Canada, the UK, Germany, Japan, South Korea and Malaysia. We couple our international expertise in large-scale, mixed-use properties, our commitment to design innovation, quality and efficiency, and local market insight, to bring our vision to life. To date, we have invested more than $8B in projects on the east and west coast and we continually assess new opportunities. At the meeting Tuesday, Greenfield, after getting a noncommittal answer regarding how many units at 550 Vanderbilt had been sold, asked what percentage of the condo buyers at the 278-unit tower were Chinese. Greenfield asked if there was a way to find out how many buyers are going to live there--which implied that absentee owners must sublet, or do shorter-term rentals--and how many were American citizens before they bought the units. "It begins to make me uncomfortable," responded Cotton, referring to the second part of the question and ignoring the first. "I'm not sure why it matters." "It made us all uncomfortable for a very long time," Greenfield countered, referring to the project as a whole. The question of absentee ownership in a condo building lingers. Both Greenfield and another audience member connected the potential condo purchase by Chinese nationals with the well-known efforts by the project developers to raise money via the EB-5 program, in which immigrant investors--most of them Chinese--gain green cards by making a purportedly job-creating investment. "What does it [EB-5] have to do with buying a condo?" Cotton asked. "Will Chinese people buy apartments? Absolutely. I'm sure they will, and I'm sure they have." Indeed, most EB-5 investors from China want to live in California. While it's certainly possible that some Atlantic Yards EB-5 investors might also invest in condos that are part of the project, there's a much vaster universe of potential condo buyers from China. Greenfield reported spotting 25 Chinese people, none speaking English, apparently on a marketing tour of 550 Vanderbilt. "What’s the problem with that?" Cotton asked. "I have no problem with that," Greenfield said. "All I'm doing is suggesting there may have been a bump in your sales initially, because it was marketed to Chinese people in China, and then it begins to go flat. I'm across the street, I get a little agitated, because it seems like nothing is on schedule, and it seems like you're doing a bait-and-switch at each juncture." "Schedules are frustrating beyond belief to all of us," Cotton responded. "A bait-and-switch I dispute highly.... Anyone is allowed to buy a condo." "As it should be," Greenfield said. Indeed, the condo was marketed in China. And that potential pool of buyers was one reason Greenland got involved in Pacific Park, as it claimed it had "an enormous customer base." Also, since many Chinese buyers are cash buyers, they supply a good foundation for a condo building sell-through; once a certain number of units are sold, banks can consider writing mortgages.